The world of dumpling making is definitely a culinary art. Dumplings have also evolved throughout the years and many countries have adapted dumplings to their own culture and food. Originally from Asia, dumplings are basically balls of dough, filled with meat and vegetables and usually cooked by boiling, steaming, frying or baking. Dumplings can be sweet or savoury. Before even writing this article and thinking 'jeez, these are the best dumplings ever!" I had no idea that I had eaten at one of the best dumpling houses in the world. Din Tai Fung is also very unique in its dumpling making, as every dumpling is hand made fresh for each order, and precisely measured to fit the 'dumpling requirements'. In every restaurant the dumplings are made almost in front of you, and with the number of staff you definitely know that they are freshly made for you. The dumplings take no longer than a few minutes to be ready and on your table, and seconds to enjoy. They are no bigger than a normal amuse-bouche, so make sure to order lots of different things but not too much as they are still very filling. 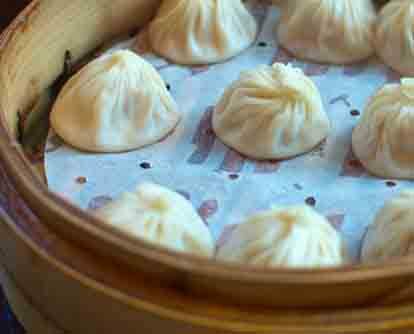 You cannot book a table at Din Tai Fung, as it's quite a fast pace environment, you get there, wait a few minutes for a table and its usually pretty packed, but it takes no longer than 15-20 minutes to get one. You are in and out in no time with the dumplings taking only minutes to cook. Their menu also includes rice dishes, not only dumplings but the dumplings are what you want to go for, they are simply delicious. One of my favourite ones is the wonton in spicy tangy sauce, accompanied by a weird but amazing avocado and chocolate swirl drink. The prices are a bit high, but once you have tasted the high quality dumplings, you know the price is worth it, plus its as fresh as it gets. Visit their website for opening hours and more information. overpriced last time I went - and beware the no-price menu - just ticking something on the list may hit you more than you expected - I think one ordinary dish cost me like $24 - watch for that !